At Northwest Community Credit Union, we love the natural beauty Oregon has to offer. Some of our favorite destinations like Crater Lake, Smith Rock, and the Oregon Coast are featured on our Northwest Rewards™ Visa® cards! As Oregonians, we consider ourselves fortunate to be so close to both the ocean and the mountains. Whether you’re looking for an outdoor adventure or a relaxing day with great views, we’re sure you can find some fun in these must-see Oregon Destinations. With all of these destinations within a day’s drive, how many will you see this summer? Located in Southern Oregon, Crater Lake is one of the most recognized landmarks in Oregon! With its striking landscape and blue crystal clear water, we understand why. Did you know this is the deepest lake in America? You'll find more than just natural beauty here. Drive up and enjoy the incredible lake view from the top rim or hike down to the water if you’re feeling more adventurous. At Crater Lake National Park, you'll find over 183,000 acres to explore. July through mid-September is a great time to visit with warmer temperatures. You can circle the lake with a boat trip, find several hiking trails, and enjoy the beauty and history of the lodge there. Our large coastline is just waiting to be explored. With so many sites to visit, you will find plenty of things to see, touch, and even taste. If you’ve seen much of Highway 101 going north or south, then you know how different and alluring the coastal towns can be. One of our favorite places includes Oregon’s one-of-a-kind sand dunes. The Oregon Dunes National Recreational Area is certainly worth the trip over. These towering sand dunes were created from years of wind and rain, leaving behind beautiful mountains of sand. There's a serene setting, gorgeous views with miles of sand, and plenty of opportunity for adventure. Spend a day on the dunes and we’re confident you'll find your own love for the sand. Delight in a peaceful walk through the park surrounded by miles of beauty. Or enjoy some fast-paced action during four days of family-friendly dune racing at Dunefest. Whether you want to relax or play in the sand, numerous things will keep you entertained all over the Oregon coast! No matter which area of the coast you venture to this summer, we’re confident you won’t be disappointed. The Painted Hills of eastern Oregon are a natural wonder. Once you see this stunning terrain, it’s clear to see how it got its name. Spectacular layers of colors spread out over a vast landscape of rolling hills make this destination truly unique. 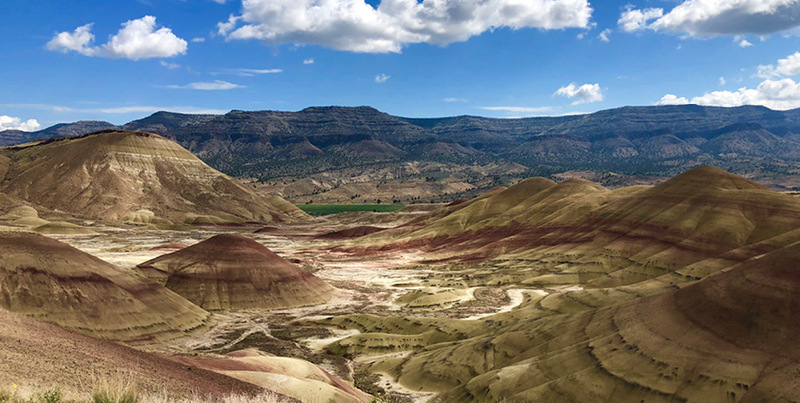 The Painted Hills are one of three sections in the John Day Fossil Beds. See them all, or stay to bask the scenery while watching the colors change throughout the day. Enjoy this destination year-round with plenty of trails to keep you in awe. Seeing millions of years of history preserved within layers of clay is sure to be unforgettable. Smith Rock State Park offers miles of trails, all with something different to offer. Rock climbing is hugely popular and brings people from all over the world. With looming rocks above head, you can see why it might be the perfect place for this daring sport. With different climbs for all levels of difficulty, you might enjoy giving it a try. Keeping your feet on the ground won’t stop you from having a great time. Go for a hike along one of the many trails offered and relish in the gorgeous backdrop, the changing landscapes, and diversities of animals found here. With lush ranches surrounding the rocky park you'll find beauty in the contrast of colors. Travel to Central Oregon and make some new memories. Unique to Oregon, this dormant volcano hosts many scenic areas to discover. Home to the legendary Timberline Lodge, historic Hood River Fruit Loop, and ample areas of forest to explore you are sure to see something unforgettable. Did you know you can ski year round at Mount Hood? It’s one of the only mountains in the world that offers this! Venture out to the town of Hood River and you'll find miles of farms and fresh fruit stands. The areas around Mount Hood offer plenty of scenic drives which boast tree lined roads, beautiful wildflowers and fragrant lavender. Along the way you'll find lots of forest land to explore, camp, or hike in. With many marked trails and lakes to see you can make the most of your time here. Pick a stop at one of the various alpine lakes showcasing marvelous views of the mountain. No matter which route you take, or town you choose to visit we’re sure you'll find gorgeous views to delight in. Take a look at camping in Oregon or check out the summer fun you could have on Oregon’s rivers!